Facebook has integrated Apple Music into Messenger. This will allow Apple Music subscribers to listen to music directly from Messenger. In order to get started, just tap on the + symbol to the left of the text box in Messenger. Just look for the Apple Music extension and tap on it to get going. Apple Music and its chat extension will start to be available to the 1.3B people who use Messenger. You can even send an emoji to the bot and it will suggest a playlist. 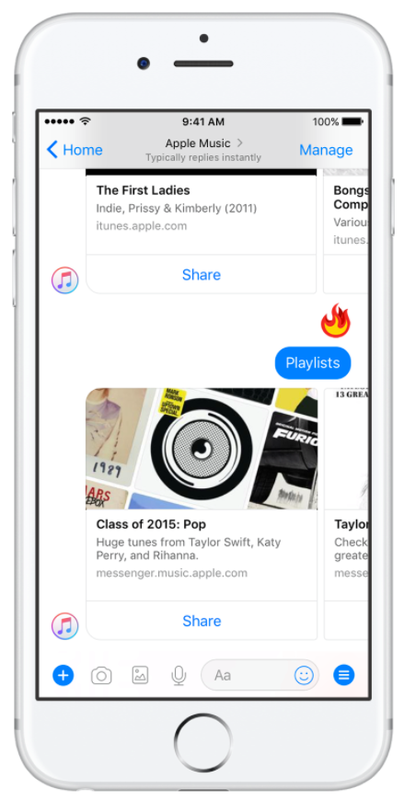 The Apple Music bot for Messenger also makes it easy to share songs with your friends. Using the Apple Music chat extension, people can share songs with a group or in a 1:1 conversation. Interested users can also easily start your 3-month free trial directly from the Messenger app. The latest move comes from Apple soon after Spotify has integrated as a chat extension this past August.